On my 8th fatherless Father’s Day, my dad found a way to send me a handwritten message from the grave. I read this article and found it very interesting, thought it might be something for you. The article is called Love, Dad and is located at http://modernloss.com/a-fathers-day-message-from-beyond-the-grave/. I’d know my father’s handwriting anywhere. At first glance, it was an elegant cursive, full of loops and slants. But look closer, and you’d realize it was mostly print with a few fancy cursive letters thrown in. Dad, who was equally comfortable in suits or cowboy boots, was a master at blending casual and formal. It’s possible that Dad single handedly kept the stationery store Papyrus and fountain pen company Mont Blanc in business during the early aughts. Every napkin, receipt, and envelope was a blank canvas for him to share his sometimes-rambling thoughts. Dad loved writing fan mail and he loved writing sympathy cards. After Lady Bird Johnson died, Dad took time out of his vacation to write a letter of condolence to Lady Bird’s daughter, Luci. When Gregory Hines came to town, Dad sent a letter to his dressing room, letting him know a certain 13-year-old tap dancer would be in the audience and sure would like to dance on stage with him. So I’ll always be able to say I once performed a tap dancing challenge with one of the world’s most iconic dancers. Now that he’s gone, I must live with the knowledge that he’ll never walk me down the aisle, that he’ll never meet my future children, that we’ll never again travel together. It’s also difficult to accept that I’ll never receive anything “new” from him — or at least that’s what I’ve assumed ever since he died. 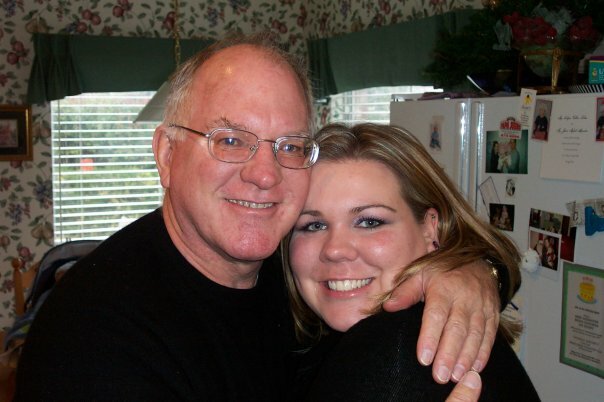 The author and her father (Courtesy of Laura Coward). But then on my eighth Fatherless Father’s Day, Dad found a way to send me a handwritten message from the grave. See, I had escaped to a cabin in the Texas Hill Country, a location my father loved, for the typically difficult weekend. Since I couldn’t be with Dad, I wanted to be alone with my thoughts. I wanted to be alone, period, until Sunday afternoon rolled around, and it was time to drive home to Dallas. But as I got closer to the cabin, I remembered a solo Hill Country trip my father had taken just a few weeks before he died. With every peach stand, winery and diner I passed, I found myself consumed with the thought: “Was dad here?” During that trip, Dad had stayed at a bed and breakfast, situated on 38 sprawling acres, overlooking Stonewall, Texas. 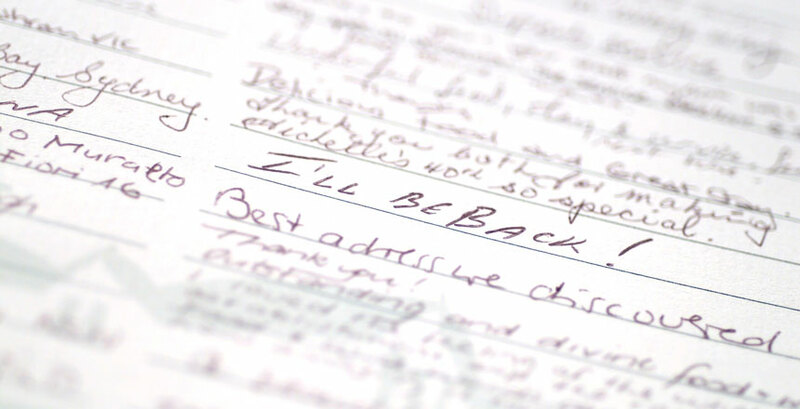 It’s where he wrote his note to Luci Baines Johnson. That weekend he drove 65 miles to Austin to see the former First Lady lying in state. That particular bed and breakfast was calling me, but I had very specific plans to avoid anything that reminded me of Dad. Instead, I cocooned myself in my cabin the first night, getting “a lot of writing done.” (Translation: I wrote for an hour or two and then found ways to procrastinate for the rest of the night.) I read through the entire cabin guestbook, imagining stories about the other people who had stayed there. Then inspiration finally returned and I wrote a scene involving a bed and breakfast and a guestbook. But the next day, while I was on hour three of writer’s block, I headed to a local winery. As I drove, I noticed a gorgeous black horse galloping along side me. She looked like Dad’s horse Jackie, named, predictably, after Jackie Kennedy Onassis. I immediately felt Dad’s presence. I pulled over to study the horse and realized I was at the turn in to the bed and breakfast where he had spent his final Hill Country trip. The horse allowed me to pet its mane, and then galloped away, up a hill, toward the entrance. I followed. I wanted to feel Dad’s aura the moment I walked through the front door of that bed and breakfast. But I didn’t. The man at the front desk asked if I was checking in, and I didn’t know the best way to say, “No, I’m good — I’m just waiting for a sign from my dead father.” The grief books never really cover that kind of stuff. Instead, I let him know my father had stayed there eight years before, before he passed away, and spoke highly of it. I just wanted to pop in to experience a taste of the place he had loved. He left for a few minutes and returned with a stack of 32 journals. He allowed me to carry them all to a spot overlooking the Hill Country, and I flipped through each one, the acid churning in my stomach as I contemplated the idea that I might be left with nothing. Then I saw it. I recognized dad’s handwriting before I read his signature. I sat staring for minutes, reading the same three sentences over and over again. He thanked the owners for the beautiful accommodations, and he told them how much it meant to stay in the Hill Country and close to Johnson City so soon after Lady Bird Johnson’s passing. His message certainly wasn’t profound, but it was joyful and grateful. And it was something new. I traced the loops of his signature, but stopped short of smelling the paper to see if his cologne had seeped through. What had started as a weekend escape to forget about Father’s Day yielded what I had longed for: a new connection to him. Tears rolled down my cheek as I self-consciously took a picture of his message. I returned the journals and then stopped in town to buy some stationery so I could send a handwritten thank-you note to the owner. Because my father taught me well. Laura Coward is a nonprofit fundraiser in Dallas. Her work has previously appeared on The Mighty, SoulPancake, Babble, Yahoo Beauty and The Huffington Post, and she rambles about Aaron Sorkin at @GreenayesLC.